The Mustang was introduced to great fanfare in the middle of 1964 during Ford’s “Total Performance” era. Despite its modest 6-cylinder origins, Ford saw a performance future for the Mustang on the great road racing circuits around the world. To really build the Mustang’s reputation, they needed to race in the SCCA series, which dominated US road racing in the Sixties. SCCA stuck to the letter of the law and tried to keep the Mustangs out by claiming that a production Mustang without a back seat to needed to be in their production line-up to qualify as a sports car, but they hadn’t reckoned with Carroll Shelby. The man who created the Cobra got another call from Ford, applied a little Texas charm to SCCA’s executives and came up with a plan to build a Mustang-based sports car. A hundred had to be ready to go by January 1, 1965 and Shelby produced, lined up and resplendent in Wimbledon White with Guardsman Blue stripes. Although not 100% done, the fiberglass hoods and Shelby identification passed the SCCA inspectors’ muster. 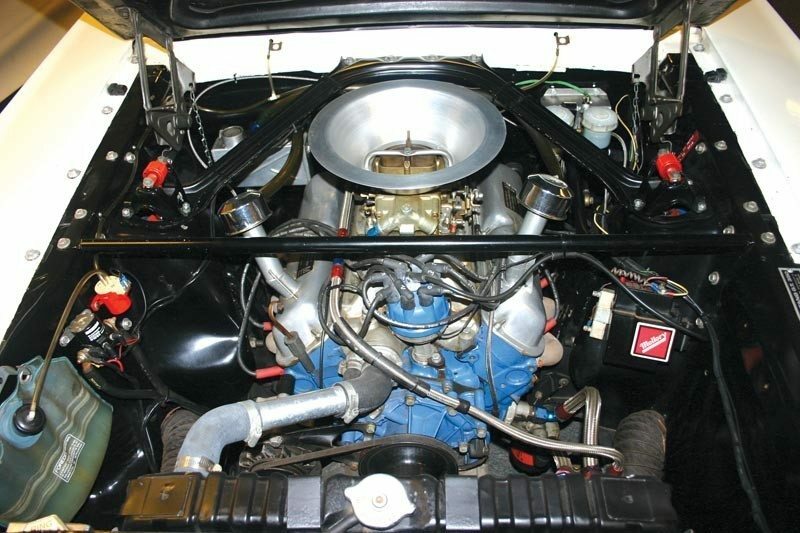 The Shelby Mustangs all had K-code engines modified with Holley 4-barrel carbs on high-rise intake manifolds, aluminum oil pans and fabricated tube headers feeding dual exhausts with glass pack mufflers. The custom suspensions front and back featured lowered front A-arms, rear axle trailing arms, Koni shocks, bigger brakes, and a Detroit Locker “No-Spin” locking differential in 9” Fairlane station wagon rear axles. They all had aluminum case Borg-Warner T-10 four-speed gearboxes, and the rear seats were replaced by a fiberglass package shelf, leaving only the front seats. 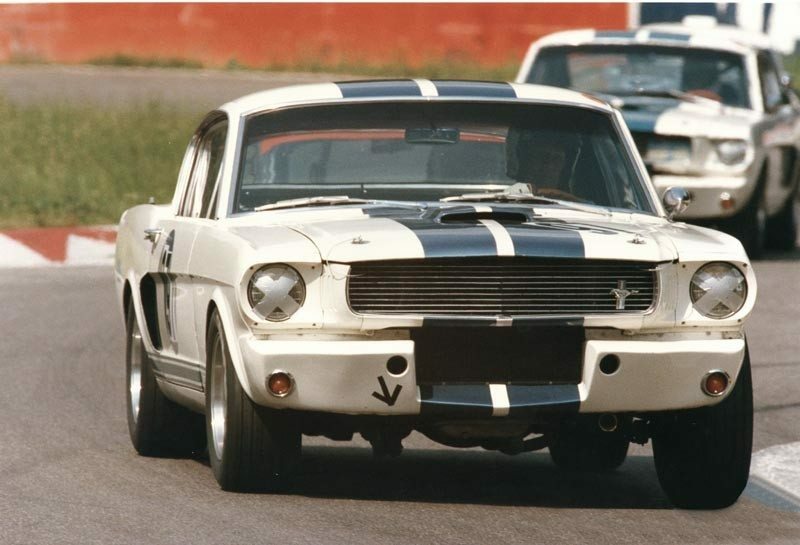 The GT350 was a modest success, with 562 built in 1965 of which 36 were “R” models, built by Shelby for racing. The first 252 ’66 Shelby Mustangs were built in Dearborn at the end of the 1965 model year to ’65 specs at Shelby American then modified with ’66 appearance items. Shelby’s designer Peter Brock came up with some external modifications, including cutting out the C-pillar sail panel and installing triangular windows and adding functional air intake scoops to help cool the rear brakes. 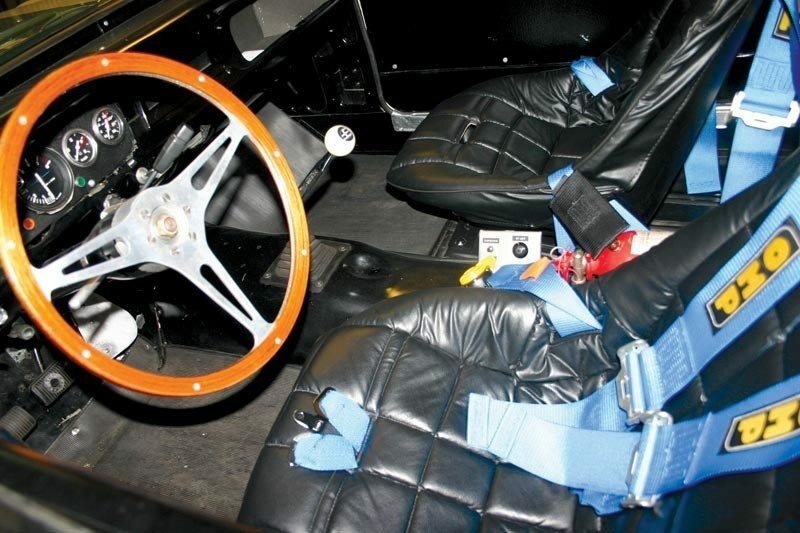 Four new colors were added and most ’66 Shelbys used Mustang’s optional fold-down rear seat to comply with the letter, if not the spirit, of SCCA’s two-seater rule. The distinctive identity of the 1966’s and a few more user-friendly options boosted the GT350’s success with 2,378 built. The GT350’s reputation far exceeds the total number built and they are among the most appreciated of all American collector cars, not only in North America but around the world. This fine example, SFM6S089, spent its early years in San Antonio, Texas, then found its way to Boston. During the 1980’s it was acquired by Peter Livanos, ocean shipping magnate and at the time owner of Aston Martin. 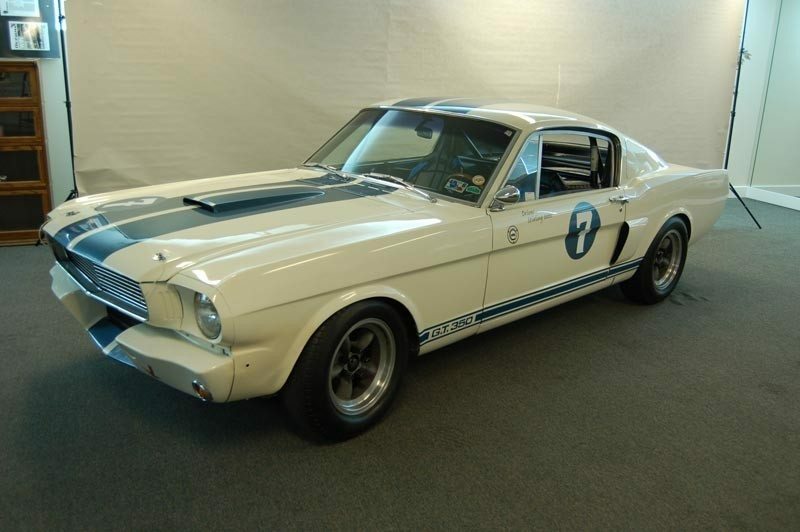 Livanos was looking for a competitive historic racing car and chose this 1966 GT350 which he had race prepared and converted to 1965 GT350R specifications by Chris Liebenberg in Connecticut. The GT350’s history with Peter Livanos is unknown but in 1993 he sold it to another experienced racing driver in search of a fast, reliable, safe historic racing car. The new owner was Sir Stirling Moss, England’s greatest driver. Moss, it should be noted, could have bought just about any historic racing car he wanted, and the ones he couldn’t afford or didn’t want responsibility for he could have borrowed from virtually any collector in the world with nothing more than a phone call. “Hello, this is Stirling Moss and I’d very much like to drive your old car at the upcoming historic meeting” is not the sort of invitation a collector – in his or her right mind – would turn down. Sir Stirling, after all, raced from 1948 to 1962, and won 212 of the 529 races he entered, including 16 Formula 1 races. He competed in as many as 62 races in a single year and drove 84 different makes of car over the course of his racing career, including Lotus, Vanwall, Maserati, Jaguar, Ferrari and Porsche. Like many drivers of the era, he competed and won in several formulas, and very often on the same day. Sir Stirling Moss chose this Shelby Mustang GT350, and the FIA Historic Vehicle Identity Form for SFM6S089 issued in 1993 is in the name of, and signed by, Stirling Moss. It was first used by him in the Targa Tasmania and has been toured and raced subsequently by him in North America and in many European venues. In fact, Sir Stirling has stated in articles that this was his favorite historic race car to drive, an opinion which, considering his history with Mercedes-Benz, Aston Martin, Maserati and Jaguar, is a ringing endorsement not only of the Shelby Mustang GT350 in general but also of this specific GT350’s preparation, performance, handling and reliability. It was sold to C.G. Gardner in London in 1999 who continued to compete successfully with it in British and European historic events until it was acquired by its present owner in 2004. In 2005 Sir Stirling was reunited with the car at the Keels and Wheels event, winning the Corinthian Award. It remains well prepared and largely in original cosmetic condition, and it has never been damaged. Indicative of its careful preservation and conversion to R-model specifications, it retains much of its original Wimbledon White paint. There is a large file of documentation with the car including the personal files of Sir Stirling Moss which have been compiled into books. Included with the car is a movie of it with Moss and his wife at the 2005 Keels & Wheels event. The car was driven by veteran Indy car and vintage racer Dominic Dobson at the 2012 Monterey Historics, and is fully capable of winning. It sold at the Worldwide Auctioneers Auburn Auction in 2012 for $561,000. It’s history and the former ownership by Sir Stirling Moss, makes it eligible to compete in vintage racing on just about any circuit in the world. It’s an American classic, with European experience, and is one of the most desirable GT350’s in the world. 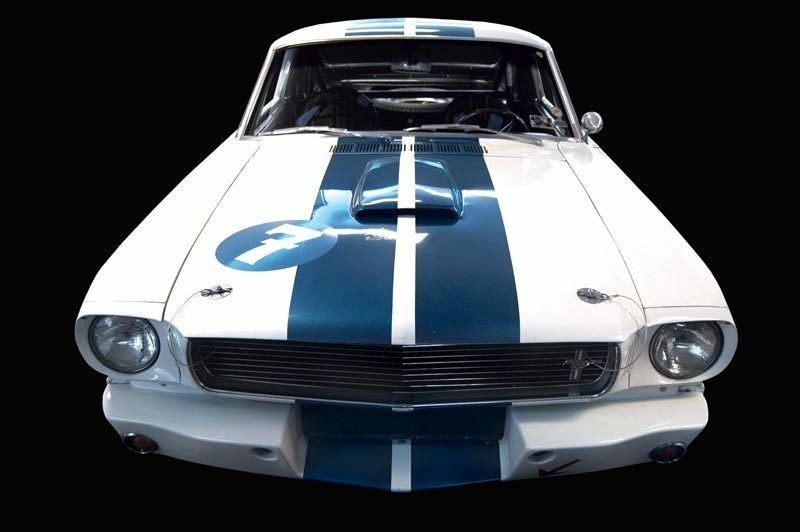 If you have a Shelby Mustang or another collectible you’d like to insure with us, let us show you how we are more than just another collector vehicle insurance company. We want to protect your passion! Click below for an online quote, or give us a call at 800.678.5173.